‘I want to ride my bicycle, I want to ride my bike. I want to ride my bicycle, I want to ride it where I like.’ Freddie Mercury, Queen. Whether you’re gunning the throttle feeling the wind in your air or simply pushing pedal power to the max, there’s something free-spirited and rebellious about a bike. And if you disagree, you probably haven’t ever ridden one. Or forgotten what the feeling is like. Either way, shame on you. Dust off your leathers or stabilisers (delete whichever appropriate) and read this piece. 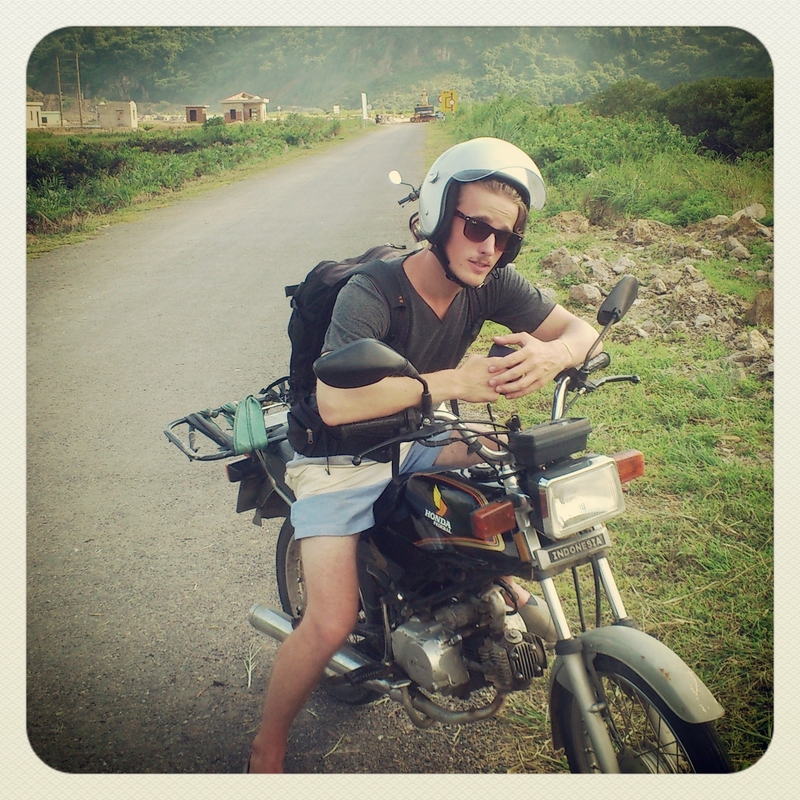 Recently I was gallivanting around Cat Ba island, Vietnam on a motorbike and it was, oh so much fun. Ok, well, it was a scooter, but I still felt like a young tearaway, trying to look cool with my big shades and little helmet. Aiming for more Easy Rider than total disaster, but who knows how I looked to locals. Particularly given the fact I was exploring the island with a young Austrian chap who was the epitome of cool; a cross between Steve McQueen and Errol Flynn (see the picture). Anyway, as you might imagine my little two-wheeled jaunt in Asia inspired me to dedicate this piece to my pick of bike scenes from movies I love. An intelligent, dreamlike, almost melancholy drama that caught most moviegoers and critics unawares, anchored by strong performances from Bradley Cooper and Ryan Gosling. The latter playing motorbike stunt rider Handsome Luke, who turns his hand to bank robbery to support his newborn child. In the clip below Director Derek Cianfrance breaks down a key scene, where Luke’s world begins to unravel as he desperately flees a bank robbery. This scene in question sees a young John Connor (Edward Furlong) being chased by the creepy, unstoppable T-1000 (Robert Patrick) in a juggernaut lorry. Closely followed by the achingly cool T-800 (Schwarzenegger), calmly reloading his shotgun one-handed before launching his Harley off the edge of a wall. Somehow he lands it then zooms up the inside of the lorry to scoop Connor off his bike, seconds before the T-1000 crushes them both. Quite simply, Director James Cameron at his best. A controversial statement given Titanic and Avatar, but I’m sticking with it. Bond films need a big, brash opening scene to set the tone. Happily Sam Mendes delivered this with gusto and glee last year, in this breathtaking, rollicking ride; a bike chase across the rooftops of the Grand Bazaar in Istanbul. Watch this fascinating behind the scenes look at how the stunt coordinators and team put this chase together. Ok, I’m putting it out there. The Last Crusade is the best Indy film. There, I’ve said it. Connery, Ford, Nazis, what’s not to like? Well maybe not Nazis, but everyone loves to hate a baddie right? So in that sense, Indy sticking it to the Nazis on motorbikes is an easy win. The scene where Dr. Jones (Junior and Senior) flee the Nazis on a bike with a sidecar is action at its best. Particularly the inspired use of a flagpole for jousting. Let’s all sing together, ‘good enough, Goonies ‘R’ good enough, ya, ya, ya, ya!’ C’mon you know the words. Written by Spielberg and Chris Columbus and directed by Richard Donner with a fantastic Cyndi Lauper soundtrack, this film was a defining coming-of-age flick. I sincerely mean that. This scene sees Mikey (Sean Astin) escape his older brother Brand (Josh Brolin) to begin their adventure. One of the best kid’s films of the ’80s. Can’t believe this film is ten years old now. Let’s face it, the Wachowski siblings set the bar extremely high with the original and, following the first film, the trilogy did somewhat lose its way. What with an overcomplicated plot involving Zion, the machines and whatnot, we all began to lose interest, slowly but surely. That said, Reloaded has some fantastic action scenes, In particular Carrie Ann-Moss’s Trinity racing the wrong way down a freeway.